The RHCM-40 Series dew point transmitter is an optical chilled mirror high performance hygrometer designed to continuously measure the moisture content in gases. The sensor provides accurate long term repeatability and high reliability performance for process control and energy management. 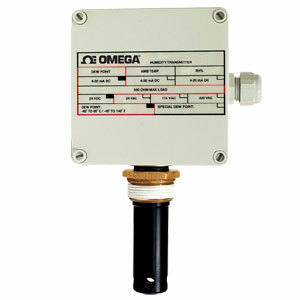 The instrument is powered by 24 Vdc or optional AC universal supply 85 to 230 Vac. The RHCM-40 series uses the chilled mirror dew point temperature condensation principle to determine the water vapor concentration in gas mixtures, and a platinum resistance RTD to accurately measure that temperature. Options include air temperature and humidity measurement. There are two selectable analog outputs which include 4 to 20 mA, 0 to 5 Vdc, or 0 to 10 Vdc and an RS232 serial port as well as electrically isolated relay contacts. Nota: Comes complete with two stage chill mirror sensor (insertion probe style, 60°C depression), 24 Vdc input power, 2 selectable analog outputs, RS232 (bi-directional), two programmable alarm relays, operator’s manual and NIST certificate.